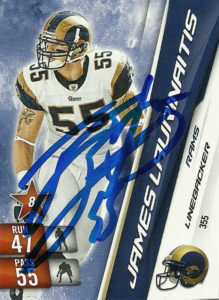 A three-time AP All-American, James Laurinaitis was the most recognized and decorated player in the 2009 draft. He was easily viewed by many as the safest selection, and boasted 366 career tackles and 9 picks while playing linebacker for the Ohio State Buckeyes. With a rare combination of size and athleticism, Laurinaitis earned the 2006 Bronko Nagurski Award and then the Lott Trophy in 2008 as the nation’s best defensive player. He was selected by the St. Louis Rams near the top of the second round at pick 35. He quickly asserted himself as the leader in the middle of the Rams defense and was named to many All-Rookie teams after putting up a line of 120 tackles, 2 sacks, and 2 interceptions in 2009. During that rookie campaign James notched a single game career high 16 tackles against the Cardinals. 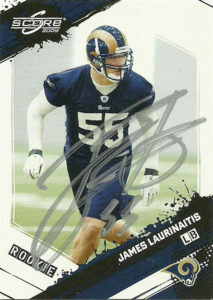 As a consistent force in the middle Laurinaitis put up 100+ combined tackles for seven straight seasons. His best season came in perhaps 2011 or 2012 when James had 142 combined tackles. In 2016, he joined the New Orleans Saints as a Free Agent. During that off season he signed these 3 cards for me. He switched to inside linebacker, and had 17 tackles through 3 games, but injured his quad. In November he was released by the Saints and had some tryouts with the Chiefs and Lions, but later opted to retire in early 2017.